Jon Lester shut the Cardinals out over eight innings to gets his 17th win as the Chicago Cubs reduce their magic number to one following their 7-0 victory Wednesday afternoon at Busch Stadium. Carlos Martinez took the loss after he gave up an RBI single to Lester in the third, a two run homer to David Ross in the fifth and a solo shot to Anthony Rizzo in the sixth. Martinez allowed four runs in his six innings of work, snapping a personal four game win streak. In the ninth, Michael Wacha, just off the DL gave up three runs, a triple to Kris Bryant, and a two run homer to Rizzo. 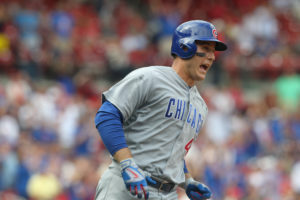 Rizzo now has 31 homers and 101 RBIs. The Cardinals head out west to San Francisco to start a long road trip that will also cover Colorado and Chicago.